P C López-López, C Márquez-Domínguez, P Molina Rodríguez-Navas, Y T Ramos-Gil (2018): “Transparency and public information in Ecuadorian television corporations: the case of Ecuavisa and TC Televisión”. Revista Latina de Comunicación Social, 73, pp. 1307 to 1332. Introduction: This research article presents the results of the application of 62 indicators of transparency and access to public information to two Ecuadorian television corporations. Methods: The study uses a purpose-created panel of indicators divided into five blocks, following the method developed by the Infoparticipa project, for the analysis of the websites of Ecuavisa and TC Televisión. The results of the evaluation of the level of transparency of these corporations is available in the Infometro section of the online platform www.mapainfoparticipa.com. Results: The selected media companies are not very transparent: the lowest scores were obtained in the identification of senior executives and the management of collective resources, while the highest scores were obtained in the area of information for participation. Discussion and conclusions: These types of organisations do not comply with the indicators of access to public information and transparency, despite having a broad regulatory development. These corporations do not disclose basic data and the information they do publish is often unclear, insufficient and inaccessible. Political communication; transparency; television; Management; accountability; public information. 1. Introduction. 1.1. Political communication, transparency and access to public information. 1.2. Accountability and open government. 1.3. Transparency in media companies. 2. Methods. 2.1. Background: the Infoparticipa project. 2.2. Infoparticipa’s evaluation procedure applied to local governments in Spain. 2.3. Infoparticipa’s evaluation procedure applied to the websites of Ecuadorian TV corporations. 2.4. Research design, objectives, sample and data-collection instruments. 3. Results. 4. Conclusions and discussion 5. Notes. 6. References. The debate on transparency and participation in media companies, and more specifically on television corporations, incorporates a discussion that goes beyond the theoretical realm to promote institutionalised tools that allow people to be more than just spectators and act as true citizens and learn about the economic management and production processes of the diversity of public institutions. Having overcome the discussion on the relevance of accountability in this type of organisations, making their processes transparent and allowing people to participate, individually or collectively, reinforces their legitimacy as mediation agents, justifies their funding, allows their adaptation to the changes of the new digital society and, ultimately, improves governance (Campos-Freire et al., 2017). The concept of governance is understood as the planning, execution and evaluation of decision-making and “includes processes and agencies that regulate the economic as well as social and democratic management of television corporations” (De Bustos, 2015, p. 3), so it is a much broader and more open concept than government (Campos-Freire, 2015). One of the major challenges faced by television corporations, mainly publicly-owned companies, is to consolidate the principles of democratic quality to solve the latent conflict between political control and its independence in the administration, that is, to make sure they are truly public and non-governmental channels. The global phenomenon of transparency, affecting all kinds of institutions and organisations, has been accelerated due to multiple factors, including: first, the loss of legitimacy of political, economic and social systems, mainly as a consequence of the economic crisis and the mismanagement of resources; second, the increase in democratic culture across countries and the decreasing permissiveness towards corruption; third, the development of legislation on access to public information in high normative levels (López-López, Vaca-Tapia & Molina Rodríguez-Navas, 2017); and finally, the dazzling development of communication and knowledge technologies that enables organisations to create web spaces for accountability and provides citizens with tools to retrieve all kinds of information. In general, transparency is linked to the democratic quality of a country (Alonso-Muñoz & Casero-Ripollés, 2017), where a low level of transparency is synonymous for precariousness (Manfredi, 2017) and an excess is a mechanism for loss of privacy (Han, 2013), personal autonomy and management. From a comprehensive conception, access to information must be standardised and systematic, and allow citizen oversight and processes of dialogue and effective feedback. Thus, the Inter-American Commission on Human Rights (2007) indicates that “access to information is an essential tool to combat corruption, (...) and improve the quality of our democracies” (p.1). In the case of the media, which practice of journalism and mediate between organisations and viewer-citizens, the demands multiply to ensure a strong institutional framework, a good management of economic and human resources and guarantee the rights of citizens in the field of information production, through codes of conduct, ethics and deontology. Many authors have researched transparency in the media and have focused on its categorisation, laying down the groundwork for its measurement; have compared transparency levels before, during and after publication of the evaluations (Heikkilä et al. 2012); have created typologies of requirements divided in the fields of corrections, ownership, staff policy, information policy, production processes and participation (Redondo García & Campos-Domínguez, 2016); and have established three large blocks of indicators to audit public and private television corporations, based on 29 indicators (López-López et al., 2017) and 58 indicators (López-López et al., 2017). This present work, whose justification is based on pertinence and relevance, overcomes the latter studies and is not restricted to establishing indicators of measurement, as it aims to establish them by understanding transparency as a necessary condition for a real process of participation, adapted to the reality of Ecuador. A reality in which transparency has had a high regulatory development through the 2004 Organic Law of Transparency and Access to Public Information, the Constitution of the Republic (2008), the 2010 Organic Law of Citizen Participation and the 2013 Law of Communication. There is high rigorousness and very few reserves for both public and private institutions, resulting in expansive, extensive and unlimited public information (López-López, Vaca-Tapia & Molina Rodríguez-Navas, 2017). From the epistemological point of view, transparency is framed in the bilateral dialogue between organisations and citizens, through digital mechanisms, within the classic definition of political communication that is materialised through the interaction and dialogue established between these two agents and the media (Wolton, 1997). At the theoretical level, the debate on the assessment of a news media company in the public space that generates this triangle, is whether to assess its media function or its organisational dimension. Due to the significance of public information, a news media company is understood in the latter dimension, since citizens do not assess the quality of the information or content that generates a media company, but rather its accountability from the economic and institutional point of view as an organisation guided by its social vocation and its public service mission. Political communication has advanced in recent years, very especially with information and knowledge technologies, leaving behind the idea that it was restricted to the mere sending of messages by political party leaders and the limited view of consultancy, to provide multidisciplinary methodological tools to assess the flows of information coming from citizens, organisations and the media. These tools have allowed, among other things, the assumption of the public character of politics, the construction of instruments that empower citizens and allow us to overcome the public-private debate on accountability, where private organisations should also be held accountable, particularly those that receive, indirectly or directly, any kind of financing or are benefitted by consolidated economic and social relations (López-López, 2018). Thus, in the relationship between transparency and political communication, the latter has allowed the improvement of the spaces for socialisation and discussion, building a more participatory democracy and promoting the inclusion of groups of citizens who were traditionally alien to the circuit of political debate and public policy. This way, we went from “an exchange of information between rulers and ruled” (Cotteret, 1977, p.1) to a confrontation of interest that feeds the political system, the media, the citizen-voter (Mazzoleni, 2010) and the dialogue between the latter and organisations through web platforms. It is important to remember that the concept of transparency is used by some governments to account for all of their actions to citizens through access to public information (Naser et al., 2017). In the case of Ecuador, there is a tendency to resort to the culture of state secret to access public information (Sánchez & Carrión. 2004) and “the process of technological acquisition in society has been slow and depends on its cost, service, promotion and competition, among other factors” (Ramos & Márquez, 2016, p.15). This allows us to analyse, for example, whether access to digital television in Latin America will be extended from ten to fifteen years for its complete transition (Hung E, 2009). New ICTs are far from consolidating in the media a culture of legality to ensure transparency in public administration, which is a fundamental factor in democratic governance (Sánchez & Carrión, 2005, p.10.). The transformation of the audiovisual sector of the last two decades in Latin America has been characterised by the strong deregulation, transnationalisation and concentration of markets. In the past five years, these dynamics have been affected by the digital transition, which is promoting a change in technological broadcasting systems and a rearrangement of the audiovisual market (Badillo and Marenghi, 2011, cited in Ramos-Gil & Márquez-Domínguez, 2016, p.6). In this field, transparency at the international level became an essential issue in the region due to the debate established by the 2030 Agenda, which was adopted by the United Nations Educational, Scientific and Cultural Organisation in 2015. In this regard, and based on the guidelines on access to information, we would have to consider the category of participation, which is not alien to the new media in the digital ecosystem and is increasingly used by different actors (Ormel, 2017). Today, open government refers to a new paradigm and model of relations between governments, administrations and society (Cruz-Rubio, 2015). Despite this theoretical perspective, international organisations such as Transparency International and the Latin American Network for Legislative Transparency, have used a variety of indicators that reflect different perceptions of corruption and visibility of information access. The rights to transparency, access to public information and, particularly, accountability, have turned into generators and consolidators of democracy (Torres, 2013). These approaches which have been implemented within the social fabric and the way of practicing citizenship have allowed this concept to be understood as a basic requirement to interact in society, seeking to consolidate democracies in Latin America (Precht & Figueroa, 2017, p. 2). Transparency and access to information, therefore, respond to an essential condition to determine a social contract that is based on the management of the public interest of open and visible representation in the eyes of any individual. It is appropriate then to deduce that the main exchange in the rules is due to procedures of the institutions, which have been involved in the development and inclusion of standards of active transparency (disclosure of information) to channel citizen participation in democratic life. In the 21st century, a healthy democracy can only be possible after - and during - the effort to promote a dialogue that gives way to a government attitude that is committed to three intertwined ideas: accountability by regulatory bodies (internal, external, public and independent or private); the open government and real citizen access to public information. “The quality of accountability depends on the quality of public participation” (Azurmendi, Llorens, López-Vidales and Bas Portero, 2015, p. 5). Departing from this framework, it is necessary, therefore, to establish a position with actors with different nature and condition - academia, communicators, media companies, executives and public institutions, social organisations, citizens- in order to materialise certain theoretical aspects that began as utopian and ended up being the result of pure democratic logic. According to UNESCO (2012, cited in Valencia-Bermúdez & Campos Freire, 2016, p.1), “a robust public broadcasting apparatus that complies with international best practices is the ideal complement to the private and community actors that make up “the media ecosystems, which has the highest relevance to democracy”. It was in the mid-20th century when the scientific discussion and the open debate on the content and control of the media system began. These issues are now at their most developed level, especially in Europe, which already has experienced a relatively broad experimental development. But, in the case of Latin America, there is a lot more to be done. Possibly, this delay is due to the social, political, economic and cultural context that, bridging the gap between regions and countries, is reflected in economic and financial crises, as well as crises of values, representation and credibility. These difficulties that can be found on the contextual analysis are the result of the absence of democratic and communicative tools which, therefore, are not proposed and, much less, implemented. And the existing political system implies a certain model of state, government and public administration. “Good governance” has been proposed to face the aforementioned crises. This term implies “openness (open government) and transparency, responsiveness, integrity, ethics, participation, accountability, efficiency and economy, accessibility, legality and quality, respect and guarantee of human rights, management evaluation, entrepreneurship, and ecology”. The objective is therefore to “analyse what is the role of the media in the promotion of democracy” (De-Frutos, 2014). Moreover, to the inefficiency of the management, organisation and funding of public information we must add another complication -or challenge- that has derived from globalisation, new technologies and international trade: the gigantic growth of competitiveness that forces public media to apply commercial strategies -to the detriment of public responsibility- in order to increase their audience, which is increasingly fragmented and complex in an environment of media convergence and communication. Accountability by a media company consists in publicly accounting to citizens and the audience -which may or may not be the same- for its operation and management of resources, subjecting itself to the public opinion based on criteria of transparency, but adapted to the characteristics of a society that changes at some points. Therefore, it is a popular clarification that should be made through more pragmatic formulas directed to the citizen and the user, and not exclusively through reports that, ultimately, nobody reads and seem to be directed only to the respective ministry to comply with the rules (Van of the Bulck, 2015). The obligation, thus, also involves facilitating and promoting access to such accounts as much as possible for the empowerment of society. The media, as enterprises that mange information products and the essential right to information, have to postulate, exemplifying the set of actors that make up the system, a dialogue precisely through accountability and access to information of public interest. “Transparency, or hyper-transparency, is part of the new citizen demands (...), becoming operative through the total and absolute auditing of the information available to organisations” (López-López, López-Golán & Puentes-Rivera, 2017, p.2). Within the democratic framework of an open government, the pillars on what the media must be built are linked to that same transparency and citizen participation. Democracy is no longer limited, in this way, to the separation of powers, some chambers of representatives, a Magna Carta or the efficiency and guarantee of social, civil and human rights. The process of democratisation in many states is showing that the correct path is precisely a more comprehensive and deeper popular sovereignty (participatory democracy), the establishment of new and original ways of participation, civic education and oversight of the responsibilities with regards to information. Even more, if possible, in an environment of instability and doubts about objective concepts such as “lie” and “reality”; and in a media sphere whose complexity has been increased by new forms of communication (social networks, as the main paradigms) where information is devalued against more sensitive and instant communicative products. This is the paradox that Bauman implicitly pointed out: society has at its disposal a whole range of information and communication technologies (ICT) and, however, is the misuse of these technologies what endangers the basic foundations of the 20th century, such as “truth”. Whatever the case, the development of ICT and, therefore, of the instruments of participation and control for citizens, forces media companies to go beyond the supply of quality products and focus on the production process of these products. That is, in addition to promoting the public service through the exercise of journalism, the media should also provide access to the data in their possession. The research design for the study of Ecuadorian television is based on the methods conceptualised and developed within the framework of the Infoparticipa project, which emerged in the Spanish university field to respond to the urgent need to improve the communication of public administrations. The absence of a transparency law had led to bad practices, reflected in the use of public media as instruments dedicated to the service of the group in power at all times, places and administration levels. So, rather than tools for participation and democratic deepening, the media were used to achieve partisan or personal objectives. Faced with the lack of legislation imposing obligations, we designed a method to evaluate transparency and a communication procedure, with the aim of highlighting the problems detected and provoke reactions that eventually lead to solutions. On the other hand, we considered that the evaluation method should consider quantitative aspects, such as the presence or absence of information on the websites of the administrations, as well as qualitative aspects, concerning the usefulness of the information, starting with the legibility and ease of access of the published information. In this regard, we considered it was essential to incorporate the analysis of the use of news spaces (Corcoy, 2016). The impact of the project was achieved through two communication strategies: on the one hand, the writing of reports of results by groups of municipalities (following population and territorial criteria) and sending them to the media, and, on the other hand, the publishing of results on a free, open-access, online map, which offered detailed information about the evaluation procedure and the results of each assessment. The first version of this map, the cornerstone of the procedure, was called Mapa de las Buenas Prácticas de la Comunicación Pública Local en Cataluña(“Map of Good Practices of Local Public Communication in Catalonia”). Afterwards, we prepared a first version of the Infoparticipa Map, which was subsequently reformulated into a second version that is currently operational at http://mapainfoparticipa.com. First, the websites of the local governments of Catalonia were analysed. Then the project was expanded to the whole of Spain thanks to two R&D projects, which enabled the development of a network of researchers in different universities in different autonomous communities, and a third on-going project . The project has been extended also to the analysis of other public administrations, such as the provincial governments and county councils of Catalonia, as well as to other countries. In particular, it has been extended to Ecuador, with the analysis of the websites of the largest municipalities, and Colombia, where the governments of the Departments are being analysed. Each of these works requires the adaptation of the procedure. Based on common criteria and an equally shared perspective, in each case we studied the characteristics of the selected public administrations, sometimes with notable differences, as well as the legislation of each country or region (in the case of Spain), to determine the obligations, terminology and other differential elements to be considered. All these cases are published on the Infoparticipa Map. In addition, a new project focused on non-profit entities has been developed and, in turn, this project has led to the creation of two platforms that aim to provide these organisations with a tool to assess their transparency level by themselves according to their needs and obligations. First, we developed in Catalonia the TransparEnt platform (http://transpar-ent.info/es), adapted to the Spanish and Catalan legislation on transparency, and subsequently published the platform adapted to the Valencian legislation for the entities of that community (http://valencia.transpar-ent.info/es/). The procedure has shown its flexibility, as well as the need to keep criteria that give unity and coherence to the project. This project proposes the use of Infoparticipa as a starting point because of the complexity with which it has been conceptualised, due to the aforementioned flexibility, because of the results obtained in collaboration with public administrations both in Spain (Moreno-Sardá, Molina Rodríguez-Navas & Simelio-Solá, 2017) and Ecuador (Medranda Morales, 2017), and because of the possibilities offered by the publication of the results on the platform. The Infoparticipa’s method was designed to develop a project capable of impacting positively on the academic, professional, political and civic fields. This is why it has been conceptualised as an audit of the transparency and quality of communication (Molina Rodríguez-Navas, Simelio-Solá & Corcoy Rius, 2017). The procedure has undergone modifications and variations since its inception because it needed to be adapted to the needs of the different cases and because there was no legislation on transparency in Spain when the project began. Subsequently, legislation on transparency was passed in Spain (España, 2013) and some of the Autonomous Communities, which also resulted in the adaptation of the method to this new situation. This work corresponds to the method used in Spain to assess local public administrations, since it is the model that was adapted in other cases. The evaluation indicators can be found in the Map, as well as the evaluation guide with the criteria used for validation. In this way, any person interested, be they politicians, scholars, representatives of civic organisations or citizens in general, can contrast the assessment with their findings and make contributions and suggestions to the project. To clarify the evaluation, these criteria are divided into three sections: (a) information, subject and content alluded by the indicator, i.e., the information that must be published on the web; (b) location or area of the website where the information should appear to improve management with accessibility criteria that facilitate the search; and (c) specific recommendations for each indicator. The evaluations are georeferenced in the Infoparticipa map. Evaluators use the content manager to validate the corresponding indicators and the system calculates the result as a percentage and assigns a colour to the mark that appears on the map: grey, when there is no website; white, when the result is below 25%; yellow, when the result is between 25% and 50%; light green, when it is above 50%; and dark green, when it is over 75%. The percentage calculation is carried out by assigning the same value to each indicator. Once the result is published, visitors can see the overall result and the results for each indicator on the map. The evaluated administrations are informed about the results and are invited to visit the map, retrieve data, learn about the detected shortcomings and fix them. If improvements are made and informed to the project team, the latter confirms them and, if appropriate, updates the information on the web. The adaptation of Infoparticipa’s method to the analysis of Ecuadorian television has considered the nature of the entities to be analysed and the country’s legislation. First, the public and private television corporations in their dimension as media companies, but also as institutions with certain characteristics that work with a public service good like information, which is constitutionally and organically recognised as a right. Secondly, their adaptation to the Ecuadorian policy framework. In particular, the evaluation considered the following legislative sources: The Constitution of the Republic (2008), the 2004 Organic Law of Transparency and Access to Public Information (LOTAIP), the 2010 Organic Law of Citizen Participation and the 2013 Organic Law of Communication. Although the Constitution contains articles that allude to transparency (articles 204 and 206), it is the Law of Transparency which establishes the obligated entities and the specific obligations. That is why this legal framework, which is broad enough for citizens to demand their rights of access to information but also incomplete in terms of participation, is a complete and complex legal framework that needs to be analysed for the construction of those indicators that enable the auditing of the behaviour of media companies (López-López, Vaca Tapia & Molina Rodríguez-Navas, 2017). In this way, and based on the methods of the Infoparticipa Map, 62 indicators were developed by the Journalism and Communication Lab for Plural Citizenship of the Autonomous University of Barcelona and the Media, Applied Technologies and Communication Research Group of the Pontifical Catholic University of Ecuador, in Ibarra. In addition to the legal obligations, these indicators take into account the recommendations made by UNESCO (2012) in its characterisation of the public service media as those with: editorial and financial independence; management autonomy; pluralism and impartiality in information production; and accountability to citizens and regulatory bodies within a board that should be explicit and have enough capacity to be held accountable. This research uses the analytical method developed by the Infoparticipa project, which is based on a combination of qualitative and quantitative techniques and a legislative review. The study is based on the application of 62 indicators, divided into 5 groups: 1) Executive staff; 2) Management of collective resources; 3) Management of economic resources; 4) Information for participation; and 5) Tools for citizen participation. The selection of Ecuavisa and TC Televisión, as the Ecuadorian television corporations used to test the indicators and validate this method, is justified by several reasons. First, the ownership of these media corporations: Ecuavisa is a private television company and TC Televisión, recently incorporated, in November 2017, to Empresa de Medios Públicos del Ecuador, following President Lenin Moreno’s executive order that allows overcoming the public-private duality and a systematic comparison. Second, the scope of their coverage and character, which in both cases is over 70% of the national territory in open-to-air VHF broadcasting format; and, finally, their leadership in terms of audience share. Figure 1: Total audience share of selected television corporations in 2016. Source: Kantar Ibope (2017). Data covers viewers 18+ and broadcasts from Monday to Friday. 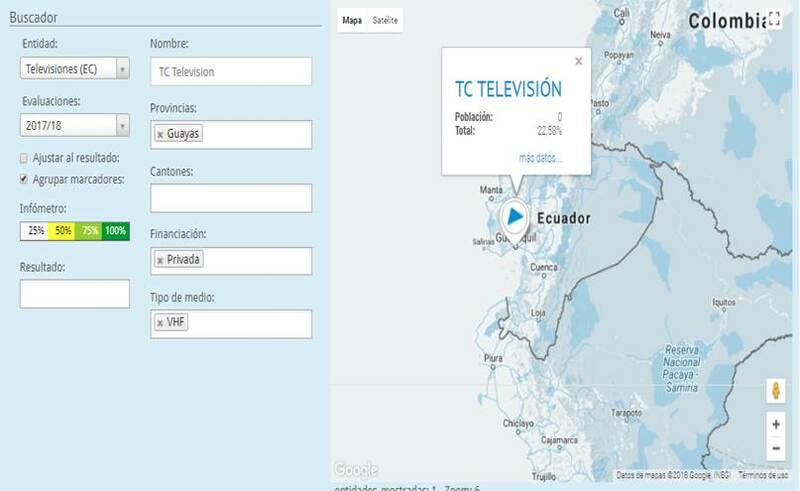 The initial consideration is that the information provided in the websites of Ecuavisa (http://www.ecuavisa.com/) and TC Televisión (www.tctelevision.com/) is clearly insufficient, in the areas of institutional and economic information as well as in terms of tools to promote citizen participation. Application of the 62 indicators to the websites of Ecuavisa and TC Televisión (in February 2018). Inclusion of the results on the Infoparticipa Map. Presentation of results in five comparative tables, by groups of indicators. Exhibition of the Infometro, i.e., the scores obtained by each corporation in the auditing. Draw conclusions that enable the managers of public information in the television corporations to establish mechanisms to make improvements in their respective entities. For this purpose, we adapted the Infoparticipa Map platform for the publication of the results. This has entailed the incorporation of new possibilities in the content manager, the modification of menus that allow users to select the information and the geolocation of the headquarters of the evaluated TV stations. In addition, as in the rest of the cases of the Infoparticipa project, we developed an evaluation guide, which will be made public through the project’s website. The identification of the people responsible for public and private institutions is essential for citizens to be able to exercise their right of supervision over the activities carried out ordinarily and extraordinarily. Their selection, which must be democratic, legal and involve processes that grant legitimacy, along with the disclosure of their merits is a precondition for participation and the right to communication. None of the television corporations provide accessible information about their director (or legal representative according to the Superintendence of companies), their resume, appointment procedure, remuneration, or activities. An exhaustive search in the reports of Ecuavisa and TC Televisión does reveal those names through citation and the signing of minutes, but this is not enough to meet the two conditions necessary for the validation of the corresponding indicator: clarity and accessibility. Does the website provide basic information about the director of the corporation: name, surname and photo? Does the website provide basic information about the director of the corporation: biography or resume? Does the website describe the method used to appoint the director of the corporation? Does the website publish the director’s (monthly and-or annual) income, travel expenses, justifications of mobilisations? Does the website publish the director’s declaration of assets? Does the website publish the director’s institutional agenda? With regards to the management of collective resources (table 2), the first indicator is positive in both cases as they do publish the annual accountability report, in addition to their required socialisation, publicity and recognition in proceedings, although this is done after the first quarter of the subsequent year. In the case of Ecuavisa (22%), article 90 of the Organic Law of Citizen Participation is adapted, targeting the two types of audiences that could access the information: virtual and in-person. Table 2. Management of collective resources? Does the website publish the annual accountability report? Does the website publish the annual operating plans? Does the website publish the legislation applicable to the entity? Does the website disclose the composition and selection of the board of directors? Does the website publish the proceedings of ordinary and extraordinary meetings of the Board of Directors? Does the website publish the declaration of assets, interests and activities of the members of the Board of Directors? Does the website publish information on representation expenses and subsistence allowance of the Board of Directors? Does the website publish the period of validity of the framework-mandate and its applicable legislation? Does the website publish basic information about the organisational structure and functions of the departments? Ecuavisa does not publish the relevant legislation, unlike TC Televisión (22%), which publishes it in its own report. Although both TV corporations try to comply with the legal parameters, there is no uniformity in the process and their presentation. According to the questions posed in table 2, the answers are negative in specific subjects on the selection and composition of the Board of Directors, the minutes of the ordinary or extraordinary meetings of such board and the declaration of assets, interests and activities of the board’s members or the period of validity of the framework-mandate, which is not even mentioned. In general, the information is unstructured and there is no mention of the basic structure of the corporation, such as the organisation chart and the definition of the functions of executive and operative staff. The general assessment of Ecuavisa’s management of economic resources (table 3) is frankly negative, as it only meets two of the 21 indicators (9.5%). This Ecuadorian media company effectively publishes an annual balance report, with relevant specifications, but the report lacks clarity and does not disclose the current budget; it indicates compliance with tax obligations but does not provide details; and informs about contracts for works and services but not rigorously since it does not publish such contracts, only the derived monetary obligations. In this sense, it fails 19 indicators (91.5%) related to the management of resources. Of these indicators, it is important to note the lack of information about the publication of collective agreements and labour rights, because these corporations only inform about their work responsibilities; and the lack of explanation about income from the public administration, advertising and sponsorships, among other sources, since it is only mentioned with respect to public media. Economic resources on TC Television are slightly better managed, as it met 14.2% of the indicators. It rightly publishes a sort of balance, but it has nothing to do with the annual budget; it also informs of compliance with tax obligations through the SRI. It also publishes other type of positive information: the exploitation of sports rights and their costs, and investment in technology, research, development and innovation (although the amounts are not disclosed). Two indicators can do little against failure in 18 (85.7%), either because there is a full informative absence, because it makes the same errors as Ecuavisa, or because there is no clear information, as in the case of the publication of audits. Does the website publish the approved annual budget, specifying costs and funding? Does the website publish the monthly budget settlement? Does the website inform of the fulfilment of the company’s tax obligations? Does the website publish the budget settlements of previous years and/or the general balance? Does the website report the income from public administration, advertising and sponsorships in a differentiated way? Does the website inform of the subsidies and other contributions granted to the company? Does the website inform on the cost of outsourced productions? Does the website inform of the exploitation and cost of sports rights? Does the website inform of the production costs and/or purchase of rights of major events? Does the website inform of investment made in film and/or other cultural industries? Does the website inform with detail of the investment made in technology, research, development and innovation? Does the website inform of the budget allocated to independent national production? Does the website publish the workers’ job posts and salary tables? Does the website publish workers’ collective agreements and labour rights, including the company’s fulfilment of labour obligations? Does the website publish the company’s full directory and staff distribution? Does the website publish the full text of all existing collective agreements? Does the website publish the company’s job offer, development of public tenders and results? Does the website publish the company’s inventory of resources and movable or immovable property? Does the website publish the contracting of works or services? Does the website publish the results of internal audits? Does the website publish pre-contractual and contractual processes of adjudication and settlement, contracting of works, purchase of goods and provision of services? Does the website publish information and/or opinions about actions of the members of the Board of Directors, the direction or the institutional activity of the media? Does the website publish the company’s code of ethics, which is aimed at improving internal management and communication practices? Does the website publish the company’s editorial policies? Does the website publish the regulation of content, including national and independent audiovisual productions (news, opinion, education, entertainment, sports, advertising)? Does the website offer information on the classification or rating of audiences and programming slots stipulated by law (family, shared responsibility, adults)? Does the website inform about the rights of Ecuador’s communities, peoples and nationalities? Does the website publish a code of treatment for priority groups (children, women, elderly, disabled)? Does the website publish historic data on broadcast content? Does the website inform on the programmes and projects that are developed for the benefit of the community in collaboration with social groups? Does the website inform about the commitments made with the community? Does the website offer a section on the history of the medium? Does the website offer information about the headquarters and physical location of the medium? Does the website publish the name, address, postal code and email address of the person in charge of public information? Does the website promote the right to access to contents for persons with hearing or visual disabilities? Does the website publish the annual report on the implementation of the right of access to public information? Does the website inform on the fines received by the medium according to the applicable legislation? Does the website publish mechanisms to disseminate the rights and obligations of citizens? Does the website publish the medium’s data protection policy? Does the website publish the medium’s self-regulation code of content and childhood? Does the website publish the audience ratings for programmes? With regards to the 20 indicators of “Information for participation” (table 4), Ecuavisa meets 7 (35%) of them and TC Televisión 9 (45%). The meaning of this block lies in the arrangement of data in a structured way to allow citizens or the public to learn on time to be able to make better decisions when it comes to using tools for participation or taking better advantage of the spaces developed for this purpose. The types of information correctly published by both television corporations include everything related to their code of ethics (including exclusive spaces), editorial policies (including mission, vision and objectives), the address of their physical location (Guayaquil and Quito), a specific section about their history (although very brief) and the publication of content regulations. This last indicator, derived from article 60 of the Organic Law of Communication and taken as valid despite the obvious need for improvement, takes into account this legal provision and also the obligation to include the national audiovisual production and the and national independent production. Additionally, Ecuavisa discloses information about the penalties it has received (article 23 LOTAIP) and publishes the guidelines for the journalistic treatment of priority groups within its code of ethics, which is accessible, but very scarce. Furthermore, TC Televisión classifies (in part) the programming slots stipulated by law, offers complete information on its commitments to the community and establishes a relationship of the right of access to public information, although it is urgent to improve its presentation, contained in the accountability report (PDF). Does the website publish information about the forms of participation or other regulations in this respect? Does the website include a section that informs citizens about the procedure to appeal to their right of reply? Does the website include an interactive space for the Ombudsman? Does the website offer effective channels for citizen participation, queries and complaints? Does the website provide mechanisms for the evaluation of programming and content? Are there any operating social networks? Negatively, there was an absolute lack of a Board of directors or a similar body in news, responsible for making institutional and economic decisions. Moreover, despite the potentialities offered by new technologies, there are no historical records of contents, the viewership data of programmes are not published and there are no spaces to inform about the rights and duties of citizens. Similarly, there is an absence of information about the multiculturalism and pluri-nationality of the Ecuadorian State, which are recognised in the 2008 Constitution, in its first article, and the 2013 Organic Law of Communication, whose article 36 establishes the right of indigenous peoples, Afro-Ecuadorians and Montubios to have their culture disseminated in the media. The tools for citizen participation that are published in the websites of the television corporations obtained different results. On the negative side, TC Televisión does not offer tools that allow citizens to share opinions and participate individually or collectively. Social networks are operational but are not embedded in any part of the website through widgets or icons. On the other hand, Ecuavisa complies with 4 of the 6 proposed indicators, although with uneven effectiveness. Users can appeal to the right of reply (article 23 and 24 of the Organic Law of Communication) and have access to guided information (the page redirects the request to the corresponding Department, which allows for more flexibility and faster feedback) through an online contact form. However, there is no Ombudsman and no possibility to rate programming and content, not even through simple scoring mechanisms. Access to public information on Ecuadorian television is guaranteed by the Constitution and the laws that protect it. Thus, the government of Ecuador faces the challenge of enabling citizens to participation and become protagonists in the social, political and communication fields. However, it is necessary to extend this responsibility from the strictly institutional fields to news media companies, such as television corporations, because their product is a civil right. Information is one of the most valued assets in today’s society, although Ecuador provides information based still on principles of action that are governed by an obsolete management model in light of the international guidelines of UNESCO. As a first conclusion, we must point out that after the application of the indicators to the websites of Ecuavisa and TC Televisión, both clearly failed the audit. 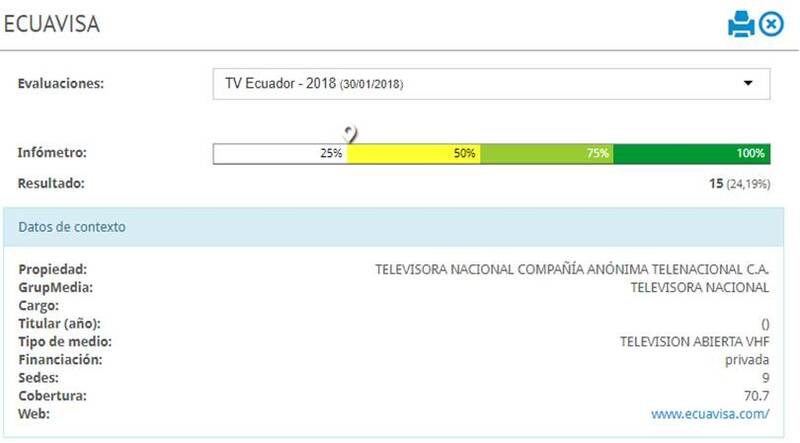 Ecuavisa only obtained a positive assessment in 15 or 24.19% of the 62 indicators, while TC Televisión only received a positive result in 14 or 22.58% of the 62 indicators. Thus, the information provided in their websites in insufficient in all the areas under analysis and the quality of the public information is deficient. Moreover, the level of accessibility is clearly low while the organisation of data is not very intuitive. It is important to emphasise the lack of willingness of the television companies to promote the identification of their highest executives, their selection method and their economic remuneration. This condition is the basis for any accountability process and its non-compliance breaks the sequence that allows the effective participation of citizens and interest groups. Legally, in Ecuador there is no law to enforce this practice, however, article 7 of the Organic Law of Transparency and Access to Public Information (LOTAIP), on the disclosure of expenses, can be extended to the recently incorporated public medium TC Televisión, which does not comply in any case. A first item to submit to discussion, and in light of the aforementioned results, has to do with the need to review the law to promote citizens’ right to know and recognize the people who manage public assets, not only the people they directly voted as representatives. In the field of the management of collective resources, there is a systematic hiding of the two basic elements that should govern a company: first, the governing body, as it is the Board of directors or similar; Second, the organisational chart that specifies the existing departments and functions. Together with the first conclusion, this causes the inability to know who is being audited. On the positive side the corporations do comply with the legal and ethical requirements, in what refers to accountability, which are elements particularly monitored by authorities: they publish, disseminate, announce, register and even present in an audiovisual format. Accountability has a specific and visible space which enables clear and fast access, although it also has an excessively purpose-driven vocation and often forgets the process that goes with it. On the other hand, the information duly published by both media about the management of economic resources is far from being positive: they publish balance sheets, but do not break them down, do not show their execution nor follow them up. Therefore, their economic management is ineffective and collides with the rights of workers, since the corporations do not inform about collective agreements, the relation of job positions, and the hiring process. A second element to be discussed is whether there is real knowledge of the obligations of the finance and human resources departments according to the Organic Law of Transparency and Access to Public Information (LOTAIP). It is also important to note that the information for participation in Ecuavisa and TC Televisión is relevant but also insufficient. On the one hand, they publish basic information (headquarters and history), the main documents that regulate the production of information, such as editorial policies and codes of ethics, but do not delve into the specific treatment of vulnerable, minority and legally-protected groups in terms of content or access (adaptation of the website to users with auditory and visual impairment). This promotes a situation of vulnerability for citizens, who are not informed about their rights in relation to the legal entity that manages such an important public good as information. In this same line, despite the apparent positive results of Ecuavisa in the category “tools for citizen participation?”, we can point out that this participation is not institutionalised in none of the analysed channels. The institutionalisation of such participation inexcusably involves the existence of an Ombudsman (article 73 of the Law of Communication), which establishes a framework of rights and systematises the tools available to citizens to monitor institutional and economic activities as well as the access to information. In short, this work clearly shows the failure of the two television corporations under analysis, because the information they provide is insufficient and deficient, because they are unwilling to disclose information about themselves, because they hide the identity of their chief executives and the way work is done, because their economic management does not even recognise their workers, and because they promote a situation in which citizens are defenceless and in which citizen participation is not institutionalised. Moreover, it is also important to delve into the need to review the legality of some aspects and the procedures in certain areas, which are standardised but are not properly followed in most cases. We believe it is desirable to apply this evaluation method to other television corporations to fully validate the 62 proposed indicators. * Funded research. The results of this article are part of the exploration works of the R&D project titled “Indicators of Governance, Funding, Accountability, Innovation, Quality and Public Service of European Radio and Television Corporations Applicable to Spain in the Digital Context” (CSO2015-66543-P), of the National Programme for the Promotion of Scientific and Technological Research of Excellence, National Sub-programme for the Generation of Knowledge of the Ministry of Economy and Competitiveness of the Government of Spain; of the International Research Network on Communication Management XESCOM (ED341D R2016/019), supported by the Department of Culture, Education and University Management of the Government of Galicia, coordinated by the Novos Medios (New Media) research group of the University of Santiago de Compostela, with the participation of the groups CP2 and TI3 of the University of Vigo and iMARKA of the University of A Coruña; of the Observatory of Transparency and Good Government of Ecuador of the Media, Applied Technologies and Communication Research Group of the Pontifical Catholic University of Ecuador, in Ibarra; and the R&D project 2016-2018 CSO2015-64568-R “Methods and information models for monitoring the action of local governments and accountability” carried out by the Journalism and Communication Lab for Plural Citizenship (LPCCP) of the Autonomous University of Barcelona. Projects: (I) Methods and information models to monitor the action of local governments and accountability. Ministry of Economy and Competitiveness, call 2015, mode 1: R&D projects of the National Programme for Research, Development and Innovation oriented to the Challenges of SocietyCSO2015-64568-R, directed by Núria Simelio Solá and Amparo Moreno Sardà, 2016-2018. (II) Public communication, transparency, accountability and participation in local governments. Ministry of Economy and Competitiveness, Government of Spain, R&D project, call 2013 of the National Programme for Research, Development and Innovation oriented to the Challenges of Society, mode 1, “Research challenges”, 2014-2016, CSO2013-46997-R, directed by Juan Luis Manfredi Sánchez. (III) Communication and journalism for citizen participation in the monitoring and evaluation of the management of local governments. Ministry of Economy and Competitiveness, VI National R&D Plan, sub-programme of basic research projects, call 2012, 01/01/2013-31/12/2015, extended until 30/09/2016, CSO2012-34687, directed by Amparo Moreno Sardà. F Campos-Freire, F (2015): “Financiación e indicadores de gobernanza de la radiotelevisión pública en Europa”. En: Marzal, J.J., Izquierdo, J. & Casero-Ripollés, A. (eds.) La crisis de la televisión pública: el caso de RTVV y los retos de una nueva gobernanza, pp. 189-216. Barcelona: Universitat Autònoma de Barcelona. M Corcoy Rius (2016): Comunicació i periodisme a les corporacions locals: de les primeres eleccions democràtiques al retiment de comptes. Permanències i canvis a les notícies, del paper als recursos digitals. Tesis Doctoral Universitat Autònoma de Barcelona. Facultat de Ciències de la Comunicació 2016. JC De Bustos (2015): “La gobernanza en las televisiones públicas autonómicas españolas”. In Congreso CICOM Televisiones Autonómicas 2015. FCom. Recuperado el 3 de enero de: https://congresocicom2015tvautonomicas.files.wordpress.com/2016/07/miguel-de-bustos1.pdf. BC Han (2013): La sociedad de la transparencia. Barcelona: Herder Editorial. H Heijji Heikkilä, D Domingo, J Pies, M Glowacki, M Kus, O Baisnée, O. (2012): Media Accountability Goes Online. A transnational study no emerging practices and innovations (MediaACT Workingpaper). Finlandia: Universidad de Tampere. PC López-López, AC Vaca-Tapia, P Molina Rodríguez-Navas, P.M (2017): “La transparencia en las televisiones del Ecuador: una revision legal de la información pública”. Comhumanitas: revista científica de comunicación, 8, vol 1, pp. 137-158. Quito: Universidad de los Hemisferios. G Mazzoleni (2010): La Comunicación Política. Madrid: Alianza Editorial. B Ormel (2017): Acceso a la información: Lecciones de la América Latina. UNESCO. A Precht & M Figueroa (2017): “Transparencia en los partidos políticos: el modelo chileno”. Revista Internacional de transparencia e integridad. 3 (2), pp. 1-10. M Redondo García & E Campos-Domínguez, E. (2016): “La transparencia mediática como mecanismo de autorregulación: análisis de su presencia en las webs de los principales medios españoles.” Ámbitos. Revista Internacional de Comunicación, 32, pp. 1-19. Unesco (2012): Quality Indicators for Public Broadcasters – Contemporary Evaluation. Brasilia: Unesco. H Van den Bulck, (2015). “PSM Accountability in Recent Decades. A Progressive Shift from State to Market”. I Arriaza Ibarra, K., Nowak, E, Kuhn, R. (Eds) Public Service Media in Europe: A Comparative Approach. London: Routledge. D Wolton (1997): Penser la communication. Paris: Flammarion. Article received on 2 May 2018. Accepted on 17 July. Published on 20 July 2018.